Kyle Edmund, Aljaz Bedene and Cameron Norrie will carry British hopes on a busy third day at the US Open after rain washed out much of day two. Edmund plays American Steve Johnson in the fifth match on Louis Armstrong Stadium at about 23:00 BST. Norrie faces Spanish 12th seed Pablo Carreno Busta at a similar time, while Bedene takes on Russian Andrey Rublev at around 19:00. Maria Sharapova, Venus Williams and Jo-Wilfried Tsonga are also in action. Edmund, Bedene and Norrie are the last remaining Britons in the singles draws after defeats for Johanna Konta and Heather Watson on Monday. World number two Andy Murray withdrew on the eve of the tournament with a hip injury. 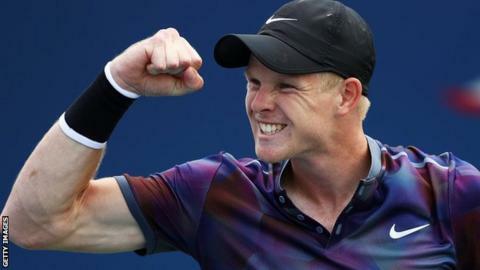 Edmund, ranked 42nd, made his Grand Slam breakthrough in New York 12 months ago when he reached the last 16 before losing to Novak Djokovic, and he is on the march again. The 22-year-old reached the semi-finals at the warm-up event in Winston-Salem last week and dispatched 32nd seed Robin Haase in round one at Flushing Meadows. If his form is flourishing, playing a ninth match in 12 days could be his biggest obstacle. "I've played a lot, so every day just to wake up and play a match becomes tiring, emotionally as well," Edmund told BBC Radio 5 live. "I knew the situation and I wasn't going to have a lot of time, I'd just have to get on with it and use the things I'm doing well." Energy levels might be low but confidence should be high against Johnson after he beat the world number 46 just six days ago. "I finished that match a lot better than I started, so the gameplan will be exactly the same, we'll know each other's patterns," said Edmund. "He serves well and has a big forehand, so that will be something to deal with. It's a good opportunity, second round of a Grand Slam, so I'm looking forward to it." Norrie, 22, is enjoying a successful first US Open after coming through qualifying and beating former world number 20 Dmitry Tursunov in the first round. The world number 225 faces a much tougher proposition against Carreno Busta. "I feel like I can go a little bit further, I'm playing some great tennis and confident," said Norrie. Sharapova will return to Arthur Ashe Stadium after her dramatic win over second seed Simona Halep on Monday night, as she takes on Hungary's Timea Babos in round two. The Russian wildcard, 30, is playing her first Grand Slam tournament since returning from a 15-month doping ban in April. "Her mentality is beyond description and she refuses to say it's over," her former coach Nick Bollettieri told BBC Radio 5 live. "On Monday night she gave everything she had, physically and mentally. Can that body do this again and again after such a long lay-off? "The determination, the mentality and the stroke production, I believe is there. It's whether or not physically she can perform like Monday night." Sharapova plays Babos in the third match on Ashe at about 21:00, before Venus Williams and France's Oceane Dodin open the night session at 00:00, and Tsonga then takes on Canada's Denis Shapovalov.